Today is also one of the 4 English "Quarter Days," days which fall around the Equinoxes or Solstices and mark the beginnings of new natural seasons ( i.e., Spring, Summer, Winter, Fall) and which were used in medieval times to mark "quarters" for legal purposes, such as settling debts. The other days like this are: Lady Day (the Feast of the Annunciation) on March 25, the Feast of St. John on June 24, and Christmas on December 25. 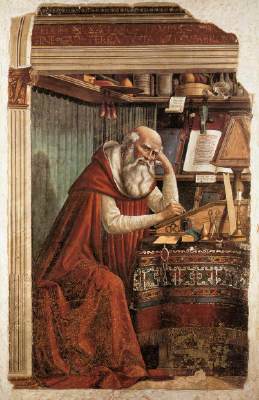 Today is the Memorial of St. Jerome, who taught us to love Scripture. Please read my post on him. "Father, you gave St. Jerome delight in his study of holy scripture. May your people find in your word the food of salvation and the fountain of life. We ask this through our Lord Jesus Christ, your Son, who lives and reigns with you and the Holy Spirit, one God, for ever and ever. Amen." 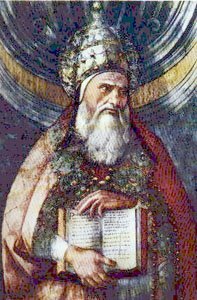 Pope St. Pius I was the tenth pope of the Holy Catholic Church from c. 140 - 154 AD. His feastday is traditionally observed on July 11th. Unfortunately it was removed from the Novus Ordo calendar like far too many other saints after the Second Vatican Council. 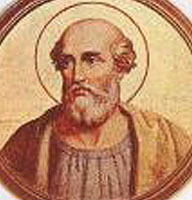 St. Pius I is remembered as the pope that helped build the Church of St. Pudenziana in Rome. He is rumored to have been the brother of the author of The Shepard of Hermas, which was considered canonical (on the same level as Scripture although it was not part of the Bible). He died in c. 154 AD and is considered a martyr, which is an unproven assertion. The papacy of Pope St. Pius I also saw the rise to one of the greatest heretics in human history - Marcion of Sinope, who said that the Old Testament God was not the same as the New Testament God. He also formed his own Bible consisting of the Gospel of St. Luke and some of St. Paul's letters, but he modified them to exclude all references to Jesus fulfilling Old Testament prophecy. The Catholic Encyclopedia says of the Marcionites: "they were perhaps the most dangerous foe Christianity has ever known." From New Line Cinema, opening December, 2006. “The Nativity Story” chronicles the arduous journey of two people, Mary and Joseph, a miraculous pregnancy, and the history-defining birth of Jesus. This dramatic and compelling story comes to life in a major motion picture starring Keisha Castle Hughes (“Whale Rider”) as Mary, Oscar Isaac (“Guerilla”) as Joseph, and Academy Award nominee Shorch Aghdashloo (“House of Sand and Fog”) as Elizabeth, the mother of John the Baptist. 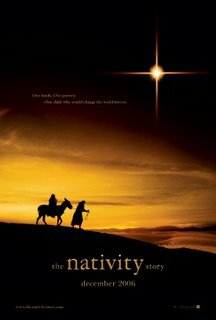 “The Nativity Story” is directed by Catherine Hardwicke (“Thirteen”, “Lords of Dogtown”) from a screenplay by Mike Rich (“The Rookie”, “Finding Forrester”). It is scheduled for a December 1 release. 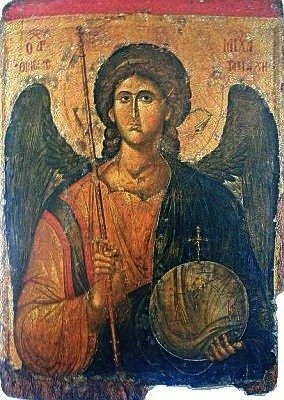 Saint Michael, ora pro nobis! Angels are pure, created spirits. The name angel means servant or messenger of God. They are celestial or heavenly beings, on a higher order than human beings. An angel has no body and does not depend on matter for his existence or activity. They are distinct from saints, which men can become. Angels have intellect and will, and are immortal. They are a vast mulitude, but each is an individual person. 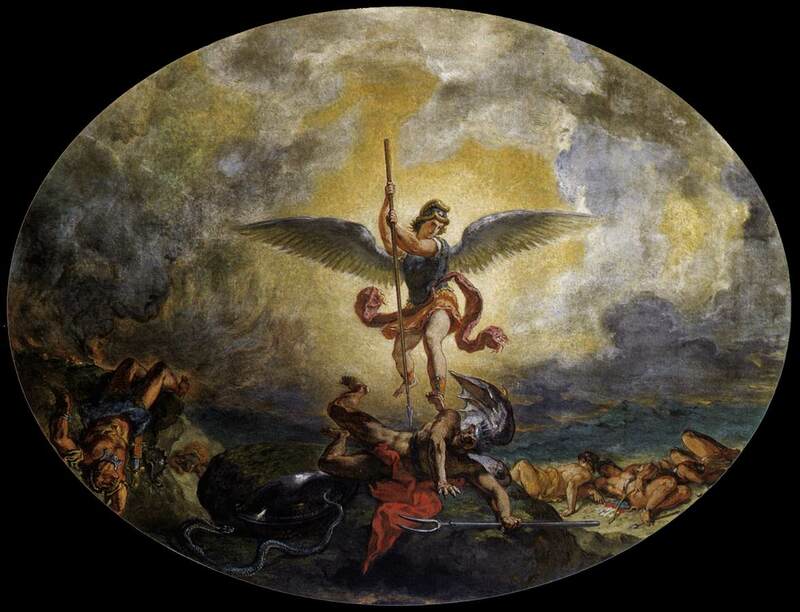 Archangels are one of the nine choirs of angels listed in the Bible. In ascending order, the choirs or classes are 1) Angels, 2) Archangels, 3) Principalities, 4) Powers, 5) Virtues, 6) Dominations, 7) Thrones, 8) Cherubim and 9) Seraphim. And see the full length St. Michael the Archangel Prayer - the full length one is one most people do not know! •To rescue the souls of the faithful from the power of the enemy, especially at the hour of death. •To be the champion of God's people, the Jews in the Old Law, the Christians in the New Testament; therefore he was the patron of the Church, and of the orders of knights during the Middle Ages. •To call away from earth and bring men's souls to judgment ("signifer S. Michael repraesentet eas in lucam sanctam", Offert. Miss Defunct. "Constituit eum principem super animas suscipiendas", Antiph. off. Cf. The Shepherd of Hermas, Book III, Similitude 8, Chapter 3). "Ignorance of Scripture is ignorance of Christ" (St. Jerome). Please join me in reading the New Testament using an online guide! 1. "God is love, and he who abides in love abides in God, and God abides in him" (1Jn 4:16). With fraternal affection I cordially welcome you, the Bishops of Ontario, and I thank Bishop Smith for the kind sentiments expressed on your behalf. I warmly reciprocate them and assure you, and those entrusted to your pastoral care, of my prayers and solicitude. Your visit ad Limina Apostolorum, and to the successor of Peter, is an occasion to affirm your commitment to make Christ increasingly more visible within the Church and society, through joyful witness to the Gospel that is Jesus Christ himself. The Evangelist John's numerous exhortations to abide in the love and truth of Christ evoke an appealing image of a sure and safe dwelling place. God first loves us (1 Jn 4:10) and we, drawn towards this gift, find a resting place where we can "constantly drink anew from the original source, which is Jesus Christ, from whose pierced heart flows the love of God" (Deus Caritas Est, 7). 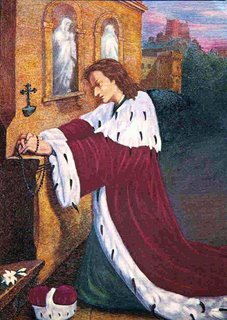 Saint John was also compelled to urge his communities to remain in that love. Already some had been weakened by the disputes and distractions which eventually lead to division. 2. Dear Brothers, your own Diocesan communities are challenged to resonate with the living statement of faith: "we know and believe the love God has for us" (1 Jn 4:16). These words, which eloquently reveal faith as personal adherence to God and concurrent assent to the whole truth that God reveals (cf. Dominus Iesus, 7), can be credibly proclaimed only in the wake of an encounter with Christ. Drawn by his love the believer entrusts his entire self to God and so becomes one with the Lord (cf. 1 Cor 6:17). In the Eucharist this union is strengthened and renewed by entering into the very dynamic of Christ's self-giving so as to share in the divine life: "He who eats my flesh and drinks my blood abides in me and I in him" (Jn 6:56; cf. Deus Caritas Est, 13). St John's admonition, however, still holds. In increasingly secularized societies such as yours, the Lord's outpouring of love to humanity can remain unnoticed or rejected. By imagining that withdrawing from this relationship is somehow a key to his own liberation, man in fact becomes a stranger to himself, since "in reality it is only in the mystery of the Word made flesh that the mystery of man truly becomes clear" (Gaudium et spes, n. 22). Dismissive of the love which discloses the fullness of man's truth, many men and women continue to walk away from the Lord's abode into a wilderness of individual isolation, social fragmentation and loss of cultural identity. 3. Within this perspective, one sees that the fundamental task of the evangelization of culture is the challenge to make God visible in the human face of Jesus. In helping individuals to recognize and experience the love of Christ, you will awaken in them the desire to dwell in the house of the Lord, embracing the life of the Church. This is our mission. It expresses our ecclesial nature and ensures that every initiative of evangelization concurrently strengthens Christian identity. In this regard, we must acknowledge that any reduction of the core message of Jesus, that is, the 'Kingdom of God', to indefinite talk of 'kingdom values' weakens Christian identity and debilitates the Church's contribution to the regeneration of society. When believing is replaced by 'doing' and witness by talk of 'issues', there is an urgent need to recapture the profound joy and awe of the first disciples whose hearts, in the Lord's presence, "burned within them" impelling them to "tell their story" (cf. Lk 24:32; 35). False dichotomies are not unknown within the Christian community itself. They are particularly damaging when Christian civic leaders sacrifice the unity of faith and sanction the disintegration of reason and the principles of natural ethics, by yielding to ephemeral social trends and the spurious demands of opinion polls. Democracy succeeds only to the extent that it is based on truth and a correct understanding of the human person. Catholic involvement in political life cannot compromise on this principle; otherwise Christian witness to the splendour of truth in the public sphere would be silenced and an autonomy from morality proclaimed (cf. Doctrinal Note The Participation of Catholics in Political Life, 2-3; 6). In your discussions with politicians and civic leaders I encourage you to demonstrate that our Christian faith, far from being an impediment to dialogue, is a bridge, precisely because it brings together reason and culture. 4. Within the context of the evangelization of culture, I wish to mention the fine network of Catholic schools at the heart of ecclesial life in your Province. 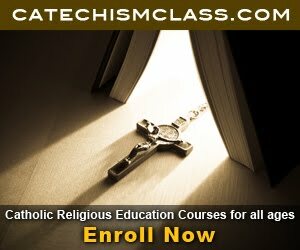 Catechesis and religious education is a taxing apostolate. I thank and encourage those many lay men and women, together with Religious, who strive to ensure that your young people become daily more appreciative of the gift of faith which they have received. More than ever this demands that witness, nourished by prayer, be the all-encompassing milieu of every Catholic school. Teachers, as witnesses, account for the hope that nourishes their own lives (cf. 1 Pt 3:15) by living the truth they propose to their pupils, always in reference to the one they have encountered and whose dependable goodness they have sampled with joy (cf. 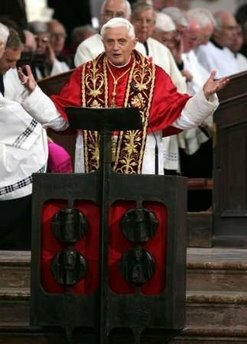 Address to Rome's Ecclesial Diocesan Convention, Living the Truth that God Loves his People, 6 June 2005). And so with Saint Augustine they say: "we who speak and you who listen acknowledge ourselves as fellow disciples of a single teacher" (St. Augustine, Sermons, 23:2). A particularly insidious obstacle to education today, which your own reports attest, is the marked presence in society of that relativism which, recognizing nothing as definitive, leaves as the ultimate criterion only the self with its desires. Within such a relativistic horizon an eclipse of the sublime goals of life occurs with a lowering of the standards of excellence, a timidity before the category of the good, and a relentless but senseless pursuit of novelty parading as the realization of freedom. 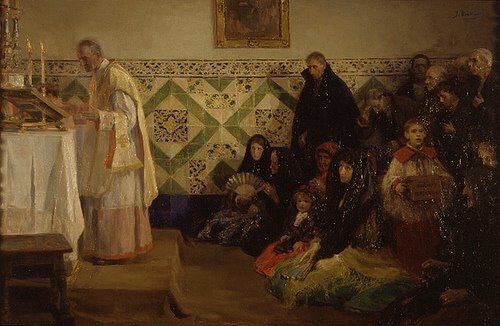 Such detrimental trends point to the particular urgency of the apostolate of 'intellectual charity' which upholds the essential unity of knowledge, guides the young towards the sublime satisfaction of exercising their freedom in relation to truth, and articulates the relationship between faith and all aspects of family and civic life. Introduced to a love of truth, I am confident that young Canadians will relish exploring the house of the Lord who "enlightens every person who comes into the world" (Jn 1:9) and satisfies every desire of humanity. 5. Dear Brothers, with affection and fraternal gratitude I offer these reflections to you and encourage you in your proclamation of the Good News of Jesus Christ. Experience his love and in this way cause the light of God to enter into the world! (cf. Deus Caritas Est, 39). Invoking upon you the intercession of Mary, Seat of Wisdom, I cordially impart my Apostolic Blessing to you and the priests, Religious, and lay faithful of your dioceses. May Canada move from the "dictatorship of relativism" that Pope Benedict warned is growing throughout the world. Call your Senators on Parental Notification Bill! Call your Senators! Frist filed for cloture vote on interstate parental notice bill! September 27,2006 - This just in from DC: "Senator Frist filed cloture on ccpa/ciana tonight, as soon as was possible. Cloture will ripen in 30 hours. Then we will vote. And we need to win." In keeping with part of my Catholic Resolution for the year, I am going to be following an online guide to reading the Bible. I didn't read all of the Old Testament, but I want to read all of the New Testament. So starting today, please follow the Catholic Doors Guide along with me and read a few chapters each day. On the last day of this year, we will have read the entire New Testament. The words of Our Lord Jesus Christ are in boldface. The words of Our Lady are in italics. Original Post: I have just received an anonymous comment saying that this person has contacted the Archdiocese of Chicago because of my posts on this blog. Here is part of the comment: "Please be advised that I have contacted the archdiocese of Chicago and advised them to review printouts from your website regarding comments you have made pertaining to Bishop Flynn and also your manner of generally conducting yourself on the site." O, how it distresses me that someone seeks to come to my blog to bring discord. Has everyone forgotten the teachings of Christ! Mercy not judgment is the answer. What have I said about Archbishop Flynn? I have said, that while he remains a successor to the apostles, he is has done things I greatly disagree with, and because of that, I chose not to consider the seminary in Minnesota. Readers can read my post on Archbishop Flynn. I never encouraged disobedience! I simply, greatly disagreed with some of his actions. Mother Angelica did even more than this when she criticized Cardinal Mahony and encouraged no obedience. I simply stated my own personal opinion. Remember, this is my personal blog, where I can state my opinions because of the great liberties of this wonderful country. Anonymous continued: "I can only suggest now that you take a deep breath and decide whether to keep fighting about these issues or simply stop what you are doing." I ask, what have I done wrong. I have seen problems in the world and addressed them. I have sought to evangelize and save souls. I do include prayers, saint information, devotions, and my own personal feelings too. What have I done wrong???? And for that, I am being condemned. So, to any that I have offended, forgive me. In light of these comments, I plan to take a break from blogging for the next few days. "Dearly Beloved: Rejoice in the measures that you share Christ's sufferings. When his glory is revealed, you will rejoice exultantly. Happy are you when you are insulted for the sake of Christ, for then God's Spirit in its glory has come to rest on you"
On September 19, 1846, the Blessed Virgin Mary appeared on the mountain of La Salette in France to Melanie Calvat and Maximin Giraud, two young shepherds who had only known each other for two days. Our Blessed Mother appeared to them on this day, the feastday of Our Lady of Sorrows, and she asked them to make her message known. Mother Mary also told each of them a private secret. The children say that Mary was in tears and her hands were folded across her chest. She spoke of how it upset her for people to swear, not go to Sunday Mass, and disobey God's laws. During this apparition, she begged us all: "be reconciled with God." 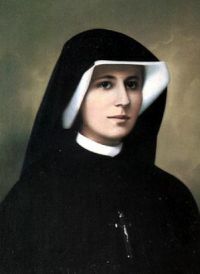 Blessed Melanie Calvat was instructed to found a new religious order, the Order of the Mother of God. Blessed Melanie was told by the Mother of God to make known her secret after the year 1858. Blessed Melanie Calvat said that both secrets were written down and handed to Pope Pius IX in 1851. In 1888, the secret was published. She also said: “Rome will lose the faith and will become the seat of Antichrist.” To call Her children to combat for God in the days of darkness and sin, the Mother of God concludes:“I address an urgent appeal to the earth: I summon the true disciples of God who lives and reigns in heaven; I summon the true imitators of Christ made man, the one true Saviour of men; I summon My children, My true devotees, those who have given themselves to Me so that I might lead them to My divine Son, those whom I carry, so to speak, in My arms, those who have lived according to My spirit; finally, I summon the Apostles of the Latter Times, the faithful disciples of Jesus Christ who have lived in scorn of the world and of themselves, in poverty and in humility, in contempt and in silence, in prayer and in mortification, in chastity and in union with God, in suffering and unknown to the world. It is time for them to arise and come forth to enlighten the earth. 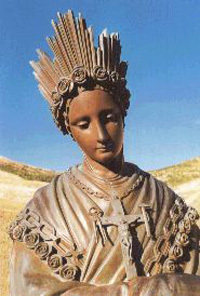 On November 16, 1851, the Holy See officially declared the apparitions at La Salette as authentic. I want to take this opportunity and state my beliefs. In response to the recent comments on the Trad Reviews post by anonymous, I feel obligated to. I am a Traditional Catholic - I want to serve the Church founded on Jesus Christ and preserved through the past two millenia. I am here to serve and teach. I am here to spread the Gospel on the Internet, and I anticipated a lot of people wouldn't like that. Surprisingly, during the past few years I learned not only computer knowledge but a wealth of information on Catholic practices, saints, etc. that I never knew before. I think that during my past year and a half blogging, I have learned probably more than I have taught my readers. One thing I have learned better is myself. I have learned that I have a vocation - a vocation to serve God - a vocation, I believe, to the holy Catholic priesthood. And during this past year I also realized that I am a Traditionalist Catholic. I want the Church to remain true to its sacred teachings. Even over the summer when I stayed with a group of Benedictine monks, I was able to grow even closer to God in realizing that I can't do everything. I learned that I can't save souls or make people believe - only God can. I want to point out the two recent comments on this blog - please read them under my post on TradReviews. First off, I do think I sound mature on this blog. I am tired of continually being called "immature" by anonymous commentors in the recent months. Are you saying I am immature because I stand for the Holy Traditions of the Catholic Church and refuse to be swerved by modernism? Secondly, I choose not to reveal my real name for my safety. Many of my fellow bloggers choose to do the same thing. In this day and age, safety on the Internet has to be a #1 priority. Please know that I do not choose to remain anonymous because I am afraid of the Church knowning my beliefs. After my ordination, I plan to not only reveal my name but place my picture online like many blogging priests do. Until that day comes, though, I choose to remain anonymous. I however am not afraid of my beliefs being "reviewed" by the Catholic Church because my beliefs are part of the Catholic Church. My priest, bishop, and other important people in my diocese already are aware of my support for the Tridentine Rite and my Traditional views. Overall, I have received great support from them. I am both a sinner and a servant of God. I am someone hoping to enter a seminary. That is who I am. If anonymous is demanding to know my name, he/she is being a hypocrite for not revealing his/her own name with his/her powerful statements. To those that wish to bring discord online, I remind you of the most important thing in the world - love. Bringing discord does not foster love. So, since this post has turned into an open post for debate, I address this to all of my readers: I want to know your comments. If you have a problem with something I do, then please let me know. And if you wish to offer support, then please do so. To all of you, regardless, I pray that you will have peace! Sara Salkahazi was beatified on September 17, 2006, at Budapest's St. Stephen Basilica. 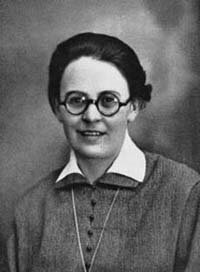 Salkahazi was a Hungarian nun that saved the lives of dozens of Jews during World War II. She is an example of the sacrificial love that Jesus calls us to show to the whole world. On Dec. 27, 1944, Sara Salkahazi was killed by the Arrow Cross - the Hungarian allies of the Nazis, for hiding Jews in the building used by her religious community, Sisters of Social Service. Her beatification was the first held in Hungary since 1083, when Hungary's first king, St. Stephen, was beatified along with his son, St. Imre, and St. Gellert, an Italian bishop who helped convert Hungarians to Christianity. It was the custom for hundreds of years to celebrate beatifications in Rome. 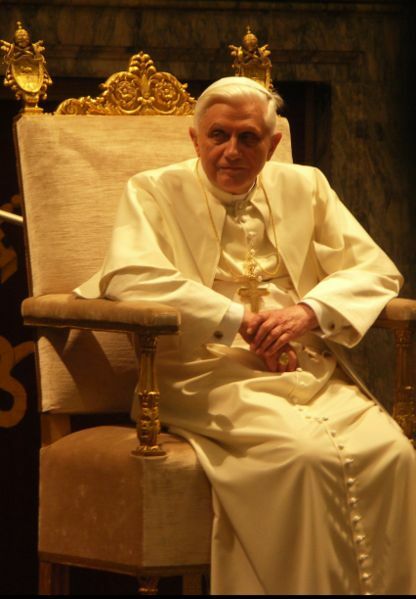 Now, canonizations will be held in Rome, but Pope Benedict XVI is allowing beatifications in other parts of the world. She was the first Hungarian beatified that was not a member of the aristocracy or royalty. Speaking at the Beatification Mass, Rabbi Jozsef Schweitzer said of Sister Sara, "I know from personal experience ... how dangerous and heroic it was in those times to help Jews and save them from death. Originating in her faith, she kept the commandment of love until death." 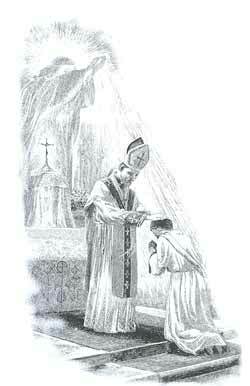 Father Mosè Tovini, a priest of the Brescia diocese in Italy, was also beatified on September 17, 2006! He was beatified in the Cathedral of Brescia, Italy. Today the Church celebrates and remembers St. Padre Pio (1887 - 1968), one of my personal favorite saints. Please read my post on the Memorial of St. Padre Pio for today. I wanted to point out a wonderful new blog I came across through Argent by the Tiber - TradReviews. The website rates movies and videos from a Traditional Catholic view. The website also points out books that should never be read because they were placed on the Index of Forbidden Books. to satisfy our hunger for God. See the humility of God. through our love, our service. Let us pray that none of us will be unfaithful. Let us pray for our poor people. They are also hungry for God." 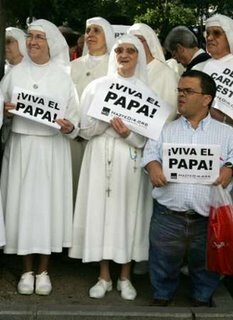 I support the Holy Father! 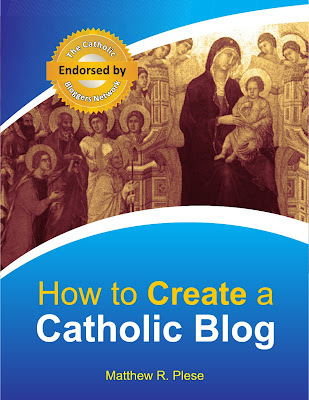 I ask all of my fellow bloggers to place an image of support for the Holy Father in your sidebar or at the top of your blogs. The Pope has apologized SEVERAL times and has said that he meant to "explain that religion and violence do not go together, but religion and reason do." Pope Benedict XVI has invited envoys from Muslim nations to visit him at his summer residence for talks on Islam. He is being so kind to those that insult him and burn his image in protests. Pray the Liturgy of the Hours in Latin! Please consider the resources below to pray the Traditional (pre-Vatican II) Breviary in Latin. 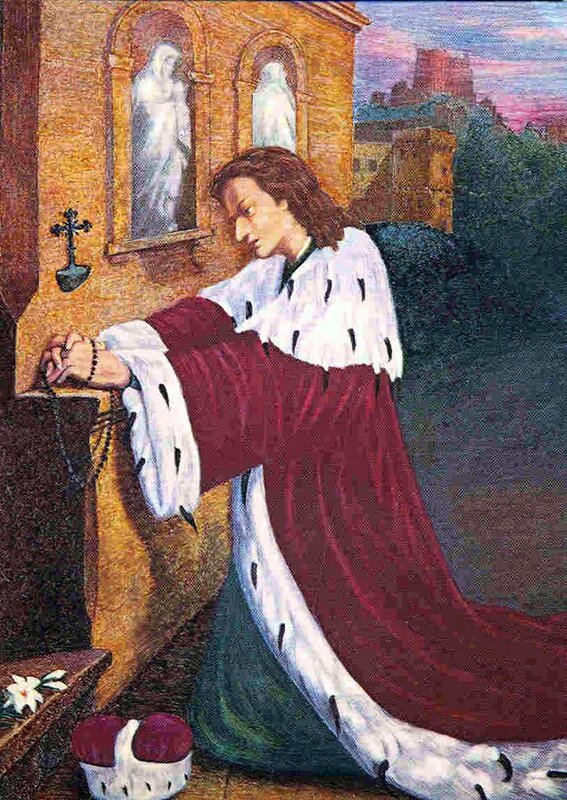 Learning the New Breviary by S. J. Bernard A Hausmann. The title word "new" is rather misleading today, as it actually refers to the new code of rubrics promulgated in July 1960 for the traditional Roman Breviary. In this handy, concise and easy-to-read book, Fr. Hausmann leads the reader step by step through each of the 8 canonical hours, their contents, special particulars, and how they are said, all the while providing important tips on how to recite the Divine Office with a correct liturgical spirit. An indispensable book for any Catholic who would like to become better acquainted with the traditional Roman Breviary, the Church's liturgical treasure that in connection with the Holy Sacrifice of the Mass forms the Church's official daily prayer. "True obedience is a genuine act of love. than to die in a moment by a stroke of the sword." O St. Joseph of Cupertino who by your prayer obtained from God to be asked at your examination, the only preposition you knew. Grant that I may like you succeed in the (here mention the name of Examination eg. History paper I ) examination. In return, I promise to make you known and cause you to be invoked. 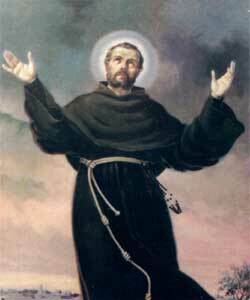 Remember, when you succeed in the exams then you should thank St. Joseph of Cupertino. Blog Banner Ads: "I Support the Pope"
The Miracle of St. Januarius Occurs! Sep. 19 (CWNews.com) - The familiar "miracle of St. Januarius"-- the liquefaction of the blood of the 4th-century martyr-- occurred once again in Naples on the saint's feast day, September 19. Cardinal Crescenzio Sepe, newly installed as the Archbishop of Naples presided for the first time at the celebration of the city's patron saint, who died in the persecutions under Emperor Diocletian. A vial containing the preserved blood of the martyr was brought into the sanctuary. After the Gospel was read, the cardinal told the congregation that "the blood is starting to melt." The announcement drew warm applause. 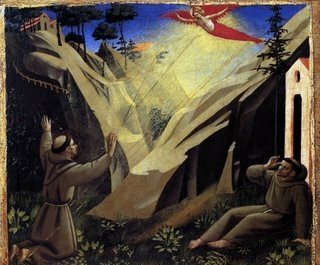 Today, September 17th, is the Commemoration of the Impression of the Sacred Stigmata which St. Francis, received on his hands, feet, and side at Mount Alverina in Etruria. While not a feastday on the revised 1969 Calendar of Saints, the feastday is still part of the Traditional Catholic Calendars. O Lord Jesus Christ, Who, when the world was growing cold, in order to enkindle in our hearts the fire of Thy love, didst renew the sacred makers of Thy Passion on the body of blessed Francis: mercifully grant, that with the aid of his merits and prayers we may ever bear our cross, and bring forth worthy fruits of penance: Who livest and reignest. Prayers Needed for the Holy Father! 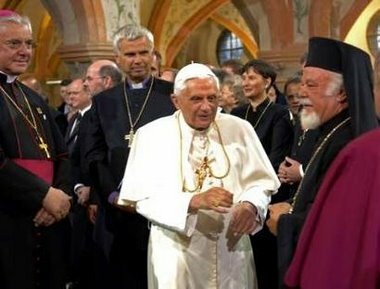 During Pope Benedict XVI's visit to Germany, he quoted a medival text that of Manuel II Paleologus, one of the last Christian emperors, who said - while Constantinople was under threat from Muslim forces - the teachings of the Prophet Muhammad were “evil and inhuman”. Manuel II also accused Muhammad of “spreading faith by the sword." 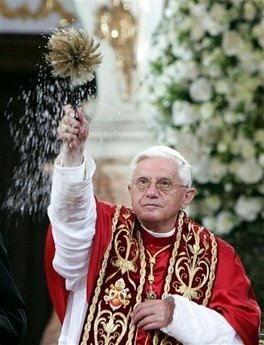 As a result, huge demoninstrations against the Holy Father have begun. 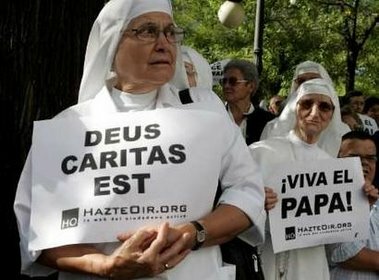 Seven churches, two this morning, in the West Bank and Gaza were burned and a nun was murdered at a children's hospital! Your prayers are desperately needed! The Holy Father apologized for his comments causing such violence. Pray that no further death or destruction will come out of this. Pray that those who resorted to violence will repent. Behold, my beloved and good Jesus, I cast myself upon my knees in your sight, and with the most fervent desire of my soul I pray and beseech you to impress upon my heart lively sentiments of faith, hope and charity, with true repentance for my sins and a most firm desire of amendment; while with deep affection and grief of soul I consider within myself and mentally contemplate your five most precious wounds, having before my eyes that which David the prophet long ago spoke about you, my Jesus: "They have pierced my hands and my feet; I can count all my bones" (Ps 22:17-18). Classes are getting a little easier and I don't have so much work right now. Thanks for your prayers! Today is also my birthday so today and tomorrow I will be spending time relaxing and enjoying some time with family. "Notice that the risen Jesus still bears his wounds. How can it be otherwise? In our own lives, times of suffering may lead to times of peace and joy, but we cannot escape the lingering effects of suffering. It permanently changes us -- we cannot pretend that it never happened. That the risen Jesus still bears his wounds is good news, for it tells us that there is a continuity between the lives we have now and the lives that we will enjoy in the Resurrection. Jesus is the same person. His wounds, though, are different: they are not a source of suffering but a source of recognition. 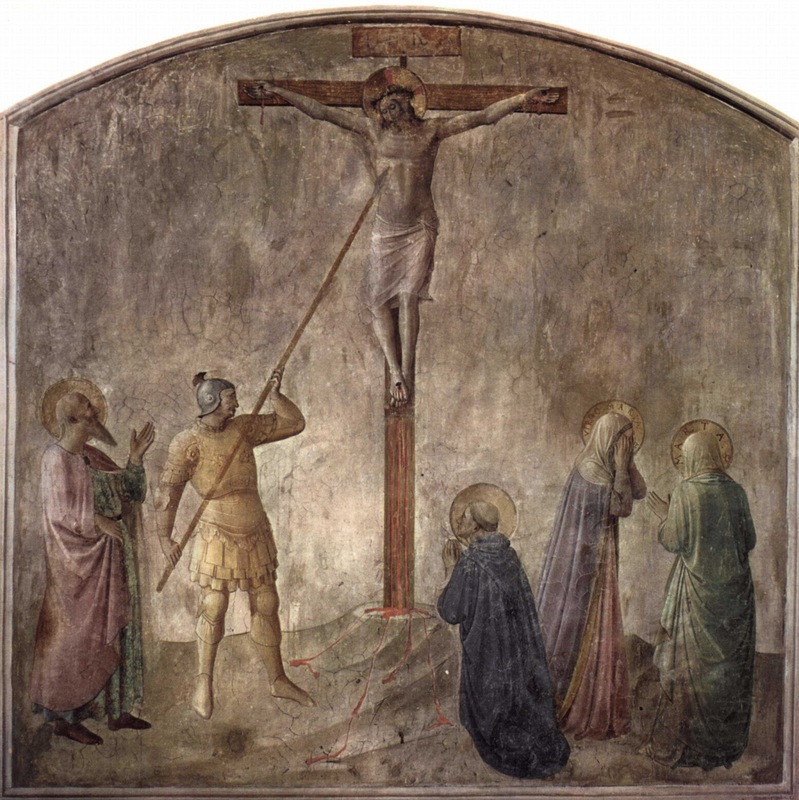 It is only through seeing Jesus' wounds that Thomas recognizes him. In the Resurrection, we will still bear the effects of the hurts that have been done to us, but they will no longer cause us pain." I am continuing my series on the popes of the Holy Catholic Church. Pope St. Hyginus was pope from c. 139 - 140 AD. He was born in Athens, Greece, and during his papacy, he determined the different prerogatives of the clergy and defined the grades of the ecclesiastical hierarchy. Hyginus also started the practice of including godparents at baptism to assist the newly born during his/her Christian life. He also decreed that all churches be consecrated. It is rumored that he became a martyr under the persecutions of Marcus Aurelius. His feast day is January 11. On Thursday, September 14, 2006, the Holy Father ended his journey to Bavaria in his homeland of Germany. 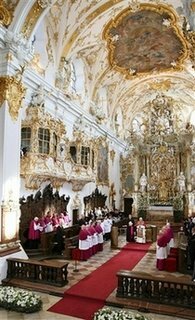 During his final day in Bavaria, he visited priests and permanent deacons of Bavaria in the cathedral of Sts. Mary and Corbinian. During the visit, he prayed before the Shrine of the Holy Corbinian, the relics of St. Corbinian. Fifty-five years ago, Pope Benedict XVI was ordained in that cathedral. 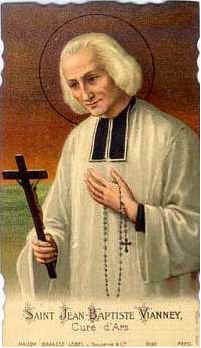 I hope all of my readers have enjoyed all of the posts on the writings of St. John Vianney. This is my final post on it - the 37th post. And I am very proud to end on his writting entitled "Catechism on Communion". After all, Jesus is truly and really present - body, blood, soul, and divinity - in the Holy Eucharist. 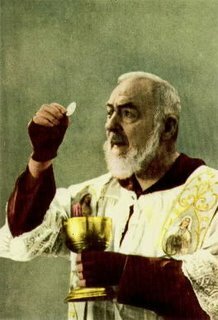 We are to adore Him in the Eucharist. We are to receive Him, while in grace, in the Eucharist. And for those that deny such a beautiful gift spoken of in the Gospel of John Chapter 6 by Jesus Himself, pray for such doubters. The Eucharist is one of the two pillars of salvation. To sustain the soul in the pilgrimage of life, God looked over creation, and found nothing that was worthy of it. He then turned to Himself, and resolved to give Himself. O my soul, how great thou art, since nothing less than God can satisfy thee! The food of the soul is the Body and Blood of God! Oh, admirable Food! If we considered it, it would make us lose ourselves in that abyss of love for all eternity! How happy are the pure souls that have the happiness of being united to Our Lord by Communion! They will shine like beautiful diamonds in Heaven, because God will be seen in them. Our Lord has said, Whatever you shall ask the Father in My name, He will give it you. We should never have thought of asking of God His own Son. But God has done what man could not have imagined. What man cannot express nor conceive, and what he never would have dared to desire, God in His love has said, has conceived, and has executed. Should we ever have dared to ask of God to put His Son to death for us, to give us His Flesh to eat and His Blood to drink? If all this were not true, then man might have imagined things that God cannot do; he would have gone further than God in inventions of love! That is impossible. Without the Holy Eucharist there would be no happiness in this world; life would be insupportable. 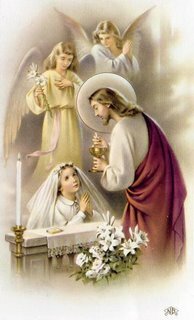 When we receive Holy Communion, we receive our joy and our happiness. The good God, wishing to give Himself to us in the Sacrament of His love, gave us a vast and great desire, which He alone can satisfy. In the presence of this beautiful Sacrament, we are like a person dying of thirst by the side of a river -- he would only need to bend his head; like a person still remaining poor, close to a great treasure -- he need only stretch out his hand. He who communicates loses himself in God like a drop of water in the ocean. They can no more be separated. At the Day of Judgment we shall see the Flesh of Our Lord shine through the glorified body of those who have received Him worthily on earth, as we see gold shine in copper, or silver in lead. When we have just communicated, if we were asked, "What are you carrying away to your home?" we might answer, "I am carrying away Heaven. " A saint said that we were Christ-bearers. It is very true; but we have not enough faith. We do not comprehend our dignity. When we leave the holy banquet, we are as happy as the Wise Men would have been, if they could have carried away the Infant Jesus. Take a vessel full of liquor, and cork it well -- you will keep the liquor as long as you please. So if you were to keep Our Lord well and recollectedly, after Communion, you would long feel that devouring fire which would inspire your heart with an inclination to good and a repugnance to evil. When we have the good God in our heart, it ought to be very burning. The heart of the disciples of Emmaus burnt within them from merely listening to His voice. 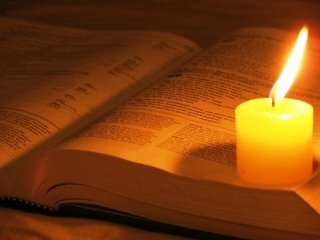 I do not like people to begin to read directly when they come from the holy table. Oh no! what is the use of the words of men when God is speaking? We must do as one who is very curious, and listens at the door. We must listen to all that God says at the door of our heart. When you have received Our Lord, you feel your soul purified, because it bathes itself in the love of God. When we go to Holy Communion, we feel something extraordinary, a comfort which pervades the whole body, and penetrates to the extremities. What is this comfort? It is Our Lord, who communicates Himself to all parts of our bodies, and makes them thrill. We are obliged to say, like Saint John, "It is the Lord!" Those who feel absolutely nothing are very much to be pitied. Today is the Memorial of Our Lady of Sorrows, where we remember the pain Mary experienced in Christ's passion. How appropriate that today is Friday - the day Jesus died on the Cross. 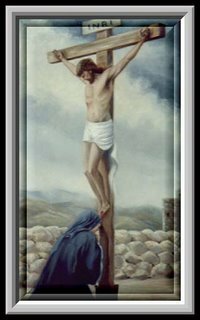 Read my post on Our Lady of Sorrows. 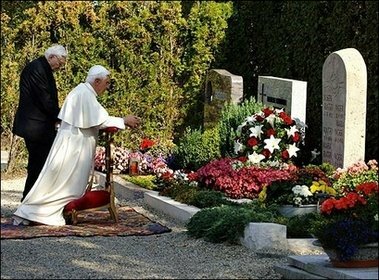 Yesterday, Wednesday, September 13, 2006, the Holy Father visited his brother, Georg, and spent time in prayer at the graves of his father, mother, and sister. I unite this dedication with the Sacred Life, Passion and Death of Jesus, with all holy Masses, ever to be said, and with all holy communions, ever to be received. I unite it with your glorious merits, dear mother, with the merits of all the saints and elect, and with all good deeds ever to be done. Help me, dear Mother, to sacrifice myself for the honor of your Son and for immortal souls. Grant, not as a reward but as a favor that I may ever serve you, and that I may never - not even by purgatory be separated from your Divine Son. O clement, O pious sweet O Virgin Mary. Amen. Today is the Exaltation of the Holy Cross, where we commemorate the saving power of the Cross of Christ. Follow the link for my post on this feastday last year. Today is also an Ember Day. God our Father, in obedience to you your only Son accepted death on the cross for the salvation of mankind. We acknowledge the mystery of the cross on earth. May we receive the gift of redemption in heaven. We ask this through our Lord Jesus Christ, your Son, who lives and reigns with you and the Holy Spirit, one God, for ever and ever. We trust completely in Your Mercy. Cleanse us from sin by Your Grace, sanctify our work, give us and all those who are dear to us our daily bread, lighten the burden of our sufferings, bless our families, and grant to the nations, so sorely afflicted, Your Peace, which is the only true peace, so that by obeying Your Commandments we may come at last to the glory of Heaven. This venerable house of God, the Basilica of "Our Lady of the Old Chapel," has been splendidly refurbished and today receives a new organ, which will now be blessed and solemnly dedicated to its proper aim: the glorification of God and the strengthening of faith. An important contribution to the renewal of sacred music in the 19th century was made by a canon of this collegiate church, Carl Joseph Proske. Gregorian chant and classic choral polyphony were integrated into the liturgy. 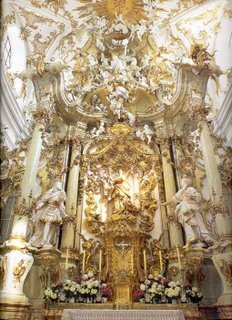 The attention given to liturgical sacred music in the "Old Chapel" was so significant that it reached far beyond the confines of the region, making Regensburg a center for the reform of sacred music, and its influence has continued to the present time. In the constitution on sacred liturgy of the Second Vatican Council ("Sacrosanctum Concilium"), it is emphasized that the "combination of sacred music and words … forms a necessary or integral part of the solemn liturgy" (No. 112). This means that music and song are more than an embellishment of worship; they are themselves part of the liturgical action. 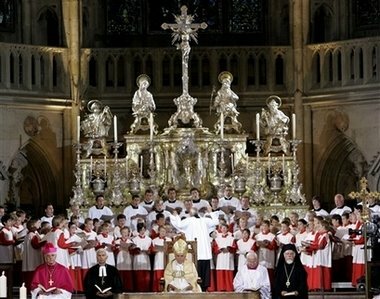 Solemn sacred music, with choir, organ, orchestra and the singing of the people, is not an addition of sorts that frames the liturgy and makes it more pleasing, but an important means of active participation in worship. The organ has always been considered, and rightly so, the king of musical instruments, because it takes up all the sounds of creation and gives resonance to the fullness of human sentiments. By transcending the merely human sphere, as all music of quality does, it evokes the divine. The organ's great range of timbre, from "piano" through to a thundering "fortissimo," makes it an instrument superior to all others. It is capable of echoing and expressing all the experiences of human life. The manifold possibilities of the organ in some way remind us of the immensity and the magnificence of God. Psalm 150 speaks of trumpets and flutes, of harps and zithers, cymbals and drums; all these musical instruments are called to contribute to the praise of the triune God. In an organ, the many pipes and voices must form a unity. If here or there something becomes blocked, if one pipe is out of tune, this may at first be perceptible only to a trained ear. But if more pipes are out of tune, dissonance ensues and the result is unbearable. Also, the pipes of this organ are exposed to variations of temperature and subject to wear. Now, this is an image of our community. 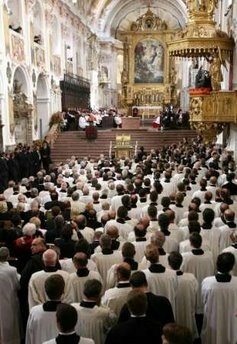 Just as in an organ an expert hand must constantly bring disharmony back to consonance, so we in the Church, in the variety of our gifts and charisms, always need to find anew, through our communion in faith, harmony in the praise of God and in fraternal love. The more we allow ourselves, through the liturgy, to be transformed in Christ, the more we will be capable of transforming the world, radiating Christ's goodness, his mercy and his love for others. The great composers, each in his own way, ultimately sought to glorify God by their music. Johann Sebastian Bach wrote above the title of many of his musical compositions the letters S.D.G., "Soli Deo Gloria" -- to God alone be glory. Anton Bruckner also prefaced his compositions with the words: "Dem lieben Gott gewidmet" -- dedicated to the good God. May all those who enter this splendid basilica, experiencing the magnificence of its architecture and its liturgy, enriched by solemn song and the harmony of this new organ, be brought to the joy of faith. Photos from this beautiful place! The Hail Mary - The Value of the Rosary. One day a colleague of mine heard the devil say during an exorcism: "Every Hail Mary is like a blow on my head. 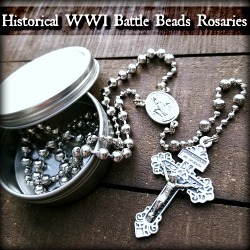 If Christians knew how powerful the Rosary was, it would be my end." The secret that makes this prayer so effective is that the Rosary is both prayer and meditation. 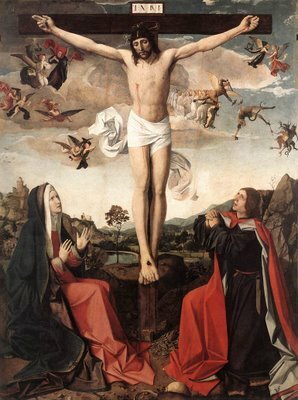 It is addressed to the Father, to the Blessed Virgin, and to the Holy Trinity, and is a meditation centered on Christ. I write in addition to the above: Please enunciate each word of the Rosary clearly and distinctly. Do not trample on the heels' of the words of anyone with your words. Do not speak over the leader, if you are following, or the responders if you are leading the Rosary. Remember that they also are having a conversation with Mary Our Mother and it is not polite to speak when someone else is speaking. In the case of the public Rosary there are only two people speaking, the Leader and the Responders. Each are speaking to their Mother and listening carefully to her response within their hearts as they meditate on the scene before them in their consideration of the mystery being spoken of and interpreted and translated into their lives. Spread this powerful prayer of exorcism, The Rosary which contains the Our Father, the Perfect Prayer, prayed five times in the recitation of each set of the Rosary's Mysteries, backed up by the powerful prayers of Our Mother who prays with us as we pray 53 Hail Marys. 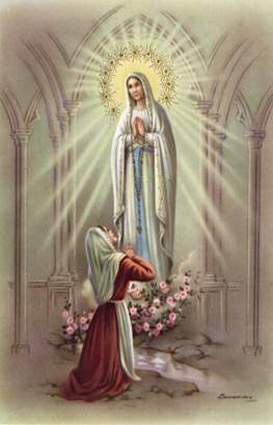 The Eternal Father described to a group of us, through a Visionary Friend of mine, what happens when we pray the Rosary, saying, "When you pray Holy Mary Mother of God, pray for us sinners now....., the Blessed Mother comes instantly to your side to pray with you. And she does not come alone. She brings angels with her. And not just one or two for she is the Queen of Angels, so choirs of angels come with her. 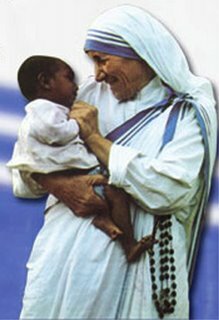 And she and Jesus are joined at the heart and cannot be separated so shebrings Jesus with her. And Jesus cannot be separated from the Trinity so He brings the Father and the Holy Spirit with Him. And where the Holy Trinity is all of creation is and you are surrounded by such beauty and light as you cannot imagine in this life. Your Mother comes as Our Lady of Grace with her hands out-stretched. Rays of light emit from her hands piercing your body, healing you and filling you with graces. This is your inheritance which was poured out from the heart of Jesus on the Cross, when the centurion pierced His Heart with the spear, into the only pure vessel ready to receive such graces at that time,Your Mother. Now as you pray the Rosary, or even just recite one Hail Mary, you receive your portion of these graces. 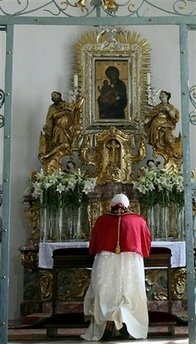 "He also said at this time, "Anyone who goes to Mary and prays the Rosary cannot be touched by Satan." 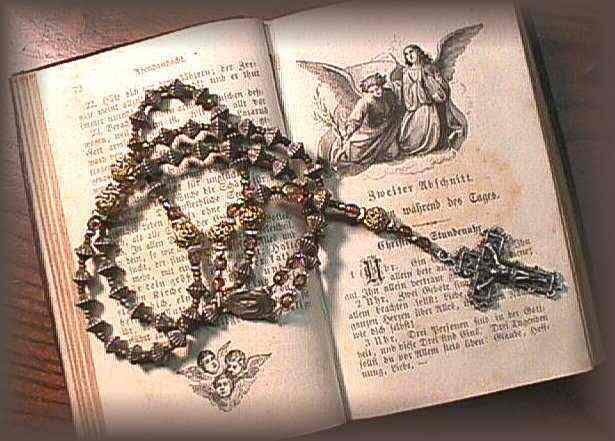 Is it any wonder that anyone who prays the Rosary from the heart is so blessed and protected and powerful in their prayers for others?" St. John Chrysostom (c. 347 - 407), called the Greatest of the Greek Fathers and the Golden-Mouth Saint, is not only venerated in Roman Catholicism but also in the Orthodox churches. In c. 347 AD, St. John Chrysostom was born in Antioch. St. John's father died soon after John's birth, so St. John was raised by his pious mother, Anthusa. St. John became a monk as well as a priest and a preacher for a dozen years in Syria. He developed a stomach ailment there that remained with him for the rest of his life. At first, though, as a monk, he lived as a hermit studying under Hesychius. 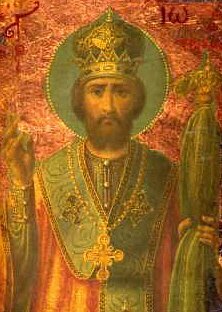 It was because of his sermons that he earned the title "Chrysostom" meaning "golden mouth". St. John was made bishop of Constantinople in 398 AD. As bishop, he criticized the rich for not sharing their wealth, fought to reform the clergy, prevented the sale of ecclesiastical offices, called for fidelity in marriage, and encouraged practices of justice and charity. Because of his work to force the rich to help the poor, he was exiled from his diocese twice. He was banished to Pythius and died on the way in 407 AD. As he was traveling to Pythius, exhausted and dying, his finally words were "Glory to God for all things." He is a Doctor of the Church. The body of St. John Chrysostom is in St. Peter's Basilica in Rome. He is also the patron saint of Constantinople, epilepsy, orators, and preachers. O God, Who didst give blessed John to Thy people as a minister of eternal salvation: grant, we bessech Thee, that we, who have had him for our teacher on earth, may deserve to have him for our advocate in heaven. Through our Lord. 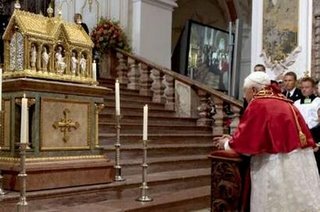 Today, the Holy Father, Pope Benedict XVI, ended another day in Germany by attending an ecumenical Vespers service. I hope and pray that there will one day be reunion with protestants and the Orthodox Community. However, I do not EVER want us to have to abandon the smallest of our beliefs to achieve such a thing. The others, I pray, will simply just return to the truth faith and stop believing in heretical ideas. All of us have common ground in our beliefs, but some groups like protestants also believe in heretical ideas like sola-scriptura, sola-fide, consubstantiation, etc. 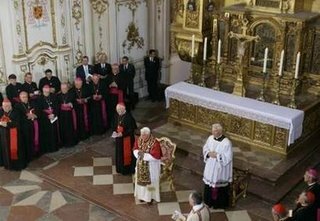 The liturgy, which was punctuated by German hymns, common to all traditions, also included traditional Orthodox chant and a response from leaders of all three Christian groups. 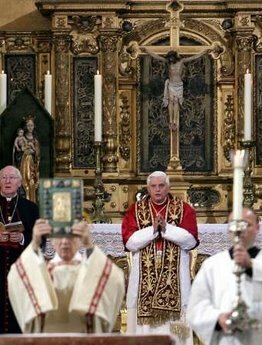 Pope Benedict began his reflection by welcoming the religious leaders and noting that at the heart of the liturgy is the praying of the Psalms, which connects the Christian church with Jewish believers as well. Our catechism tells us, my children, that all men will undergo a particular judgment on the day of their death. No sooner shall we have breathed our last sigh than our soul, without leaving the place where it has expired, will be presented before the tribunal of God. Wherever we may die, God is there to exercise His justice. The good God, my children, has measured out our years, and of those years that He has resolved to leave us on this earth, He has marked out one which shall be our last; one day which we shall not see succeeded by other days; one hour after which there will be for us no more time. What distance is there between that moment and this -the space of an instant. Life, my children, is a smoke, a light vapour; it disappears more quickly than a bird that darts through the air, or a ship that sails on the sea, and leaves no trace of its course! When shall we die? Alas! will it be in a year, in a month? Perhaps tomorrow, perhaps today! May not that happen to us which happens to so many others? It may be that at a moment when you are thinking of nothing but amusing yourself, you may be summoned to the judgment of God, like the impious Baltassar. What will then be the astonishment of that soul entering on its eternity? Surprised, bewildered, separated thenceforth from its relations and friends, and, as it were, surrounded with Divine light, it will find in its Creator no longer a merciful Father, but an inflexible Judge. Imagine to yourselves, my children, a soul at its departure from this life. 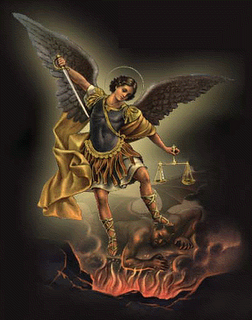 It is going to appear before the tribunal of its Judge, alone with God; there is Heaven on one side, Hell on the other. What object presents itself before it? The picture of its whole life! All its thoughts, all its words, all its actions, are examined. This examination will be terrible, my children, because nothing is hidden from God. His infinite wisdom knows our most inmost thoughts; it penetrates to the bottom of our hearts, and lays open their innermost folds. In vain sinners avoid the light of day that they may sin more freely; they spare themselves a little sham in the eyes of men, but it will be of no advantage to them at the day of judgment; God will make light the darkness under cover of which they thought to sin with impunity. The Holy Ghost, my children, says that we shall be examined on our words, our thoughts, our actions; we shall be examined even on the good we ought to have done, and have not done, on the sins of others of which we have been the cause. Alas! so many thoughts to which we abandon ourselves -- to which the mind gives itself up; how many in one day! in a week! in a month! in a year! How many in the whole course of our life! Not one of this infinite number will escape the knowledge of our Judge. The proud man must give an account of all his thoughts of presumption, of vanity, of ambition; the impure of all his evil thoughts, and of the criminal desires with which he has fed his imagination. Those young people who are incessantly occupied with their dress, who are seeking to please, to distinguish themselves, to attract attention and praise, and who dare not make themselves known in the tribunal of Penance, will they be able still to hide themselves at the day of the judgment of God? No, no! They will appear there such as they have been during their life, before Him who makes known all that is most secret in the heart of man. 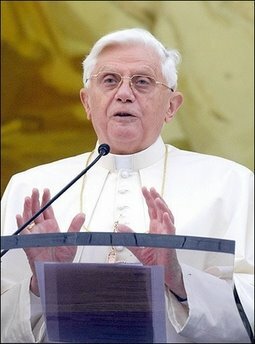 Pope Benedict XVI to visit Bavaria, Germany! New Traditional Institute Created by the Vatican!